NEW LISTING: BUILDING ONLY FOR SALE - NOT THE BUSINESS! SELLER IS BUILDING NEW OFFICE IN CLOVERDALE! LARGE HOME PRESENTLY BEING USED AS REAL ESTATE OFFICE BUT WAS RESIDENTIAL IN THE PAST BUT WOULD TAKE A VARIANCE FOR RESIDENTIAL. PRESENTLY ZONED B-2. 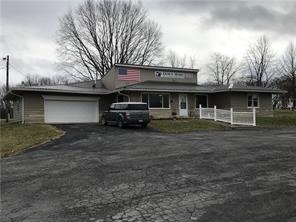 2833+/-SF ranch with potential of 5 bedrooms and 2 baths. Large entry area with counter, large kitchen with many cabinets. Back area was finished out with 3 large rooms with a total of 8 large rooms and 2C-attached garage all on almost 1/2 acre. New furnace/C/air, New water heater, new roof, new gutters, alarm system, new garage door. Black top parking area. Agent owned. THIS IS A DUPLICATE OF MLS 21613320. $159,900 Call Jim or Beth Neeley at 765-721-4149 or 765-376-6240 for more information.